What did you fly today? Yes! And that pic was from yesterday, we were at the smithville airport doing static displays for their annual fly in. Always a great time and usually some pretty cool aircraft come in. I flew my FL tigercat, cz T28, FL P38, Hellcat, B26, and FZ seawind today, approximately 14 flights total. Loads of fun today. And my mom came back home from the hospital as well. So all in all a truly perfect Sunday in Texas. I don't know the situation, but anytime mom is in the hospital that's not good, but I'm glad to hear she make it home. She is in my prayers friend. Thanks my friend, we're all doing well tonight mom is watching her dance program she always watches on Monday nights. only 170 hours on the Hobbs. Had my own warbirds festival today, since our club held our annual one on Saturday, the weather was bad and the flight patterns were full so I didn't get to fly as much as I wanted (but then I never get enough flying no matter what). The weather still isn't great, but just getting out is reward enough. Hangar: FlightLine-F4 Phantom, F-4 Blue Angel, 1600mm Corsair & Spitfire, Olive & Silver B-24, Stinger 90. Extreme Flight-Slick 60, 62" MXS Heavy Metal, 62" MXS Green, 62" Demonstrator. FMS-1700mm P-51, Red Bull Corsair, Red Bull Edge. E-Flite-2-Beast 60's, P2 Bi-Plane, Yak 54, 2-P-51's, Apprentice, 2-Super Cubs w/Floats. Spare Parts for each plane to crash at least 3 times-I need them. Also threw in my Yak for a little acrobatic fun. Although this Yak was discontinued, I've had it for several years and I love flying it-have 2 in case I destroy the first (yes, several mishaps but so far have fixed them all so the 2nd is still a virgin). 3 packs through the FW f-86. Its a tough call between the FMS a6m and the fw f86 for best flying foam rc plane. I flew 3 packs in my seawind off my pond. Was a good time for flying! One of the easiest planes to fly off the water ever, I love this plane! Here's a look at my at home flying area, yes we own both sides of the road. Dangit! I really want to get my pilot license someday. For about 3 years now I had my eyes set on the Searey anphib. Someday I hope. Well, ya already know an Instructor! [QUOTE=rifleman_btx;n132779]I flew 3 packs in my seawind off my pond. Was a good time for flying! One of the easiest planes to fly off the water ever, I love this plane! [/QUOTE Best of both worlds man! I'd haffta take a fishin pole with me. I flew 3 packs in my seawind off my pond. Was a good time for flying! One of the easiest planes to fly off the water ever, I love this plane! [/QUOTE Best of both worlds man! I'd haffta take a fishin pole with me. Absolutely, it's all right there. I love it! I showed up last night, loaded trailer in tow. 5 flights with the A-10 before noon. Took the kids out to the field this mornin'. Another good day... no glue needed! So was this your maiden with the Corsair? Broke out the seawind today again, man it's so good to fly at home again. One day I'm gonna get with my dad about moving the fence over by the driveway so I can make a landing strip for my land based planes as well. Anyway ran three packs through her and it was three total perfection flights with touch and goes and everything has a glide slope from 80 feet up to touchdown is right at 150 yards dead stick, just crazy numbers. Absolutely a beautiful plane to fly off water. 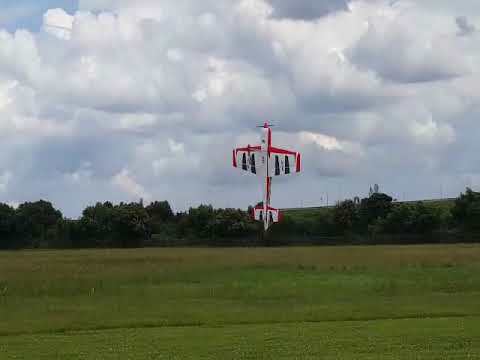 Flight off the grass field of our club it handled perfectly take off to landing. I would definitely give it a 5 star rating for that, the only weak point is the nose gear retract unit slips the pushrod from time to time, but it does takes some serious force to do so, so the entire plane would receive 4 stars as a whole. As assembly and fit and finish are totally 5 star worthy. In other words the fly zone seawind is one hell of a plane across the board.